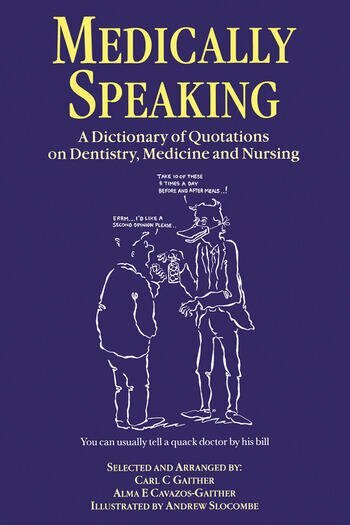 Medically Speaking: A Dictionary of Quotations on Dentistry, Medicine, and Nursing contains over 1,500 quotes pertinent and especially illuminating to these disciplines. Here you will find quotations from the most famous to the unknown. Some are profound, some are witty, some are wise but none are frivolous. 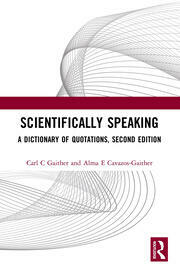 The extensive author and subject indexes provide the perfect tool for locating quotations for practical use or pleasure. This book can be read for entertainment or used as a handy reference by students and professionals and the wider public interested in who has said what on medicine. 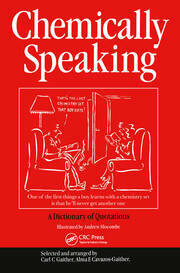 "...this is a good buy if you want to improve the quality of your presentations. Hopefully it will only be a matter of time before prizes at conferences are awarded not only for the best content, but also for the most enlightening and amusing talk." "Substantial, well presented, and indexed book."